Cui is from Shaanxi province. 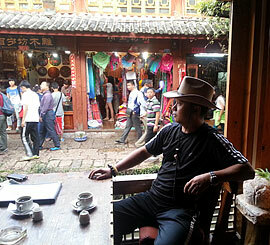 He was graduated from Xi’an Art Academy in 1989 and specialized in oil painting. Xi’an was the ancient capital of China dated back to the Qin Dynasty. Emperor Qin, the first emperor of China (210 BC to 259 BC), ordered the construction of the Great Wall of China. Through the years, Cui had participated in many art exhibitions and competitions in China and abroad. In 2010, a collection of Cui’s work of art was published by the Shaanxi Minzu Art Publishing Company which marks an important milestone for the artist. “Oil paintings by Cui are very popular and eye-catching in a way they are colorful, bright and relaxing,” said art critics. People can find his work of art in many galleries in Shaanxi. Selected artworks by Cui were acquired by art museums and private collectors in China.